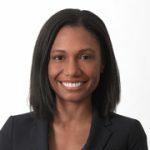 Ebonie joined First Long Island Investors in 2015 as Assistant General Counsel. Her responsibilities at the firm include legal and compliance matters and family office projects. Before joining FLI, Ebonie worked as a corporate and private funds attorney in the New York City office of the law firm Gibson Dunn & Crutcher LLP. She has also held in-house legal positions at the NYC Department of Cultural Affairs and Lincoln Center for the Performing Arts. Ebonie graduated from Harvard University in 2006 and received a J.D. degree from Columbia University School of Law in 2009. She was admitted to the New York State Bar in 2010. Ebonie lives in Port Washington with her husband and son. In her spare time she enjoys taking ballet and yoga classes. To contact Ebonie, please email her at ebonie@fliinvestors.com.